One of Ev’s and my favourite restaurants is a Szechuan place about a 5 minute walk from our apartment. It’s dangerously close, so our rule is that we can’t buy dinner more than once a week. It’s right next to the sushi restaurant that we used to spend all our money at… for all our neighbourhood could never be described as the most desirable one out there, it is not lacking in cultural diversity, which makes for a great selection of restaurants… I just wish I could eat at more of them! But if I’m careful then it’s normally doable – I just need to research the menus beforehand. One of the best meals we’re had at this restaurant is the “choose your meat and tofu dry pot;” They even let us do a “tofu and tofu” dry pot, though it’s not on the menu and we got a few confused looks. 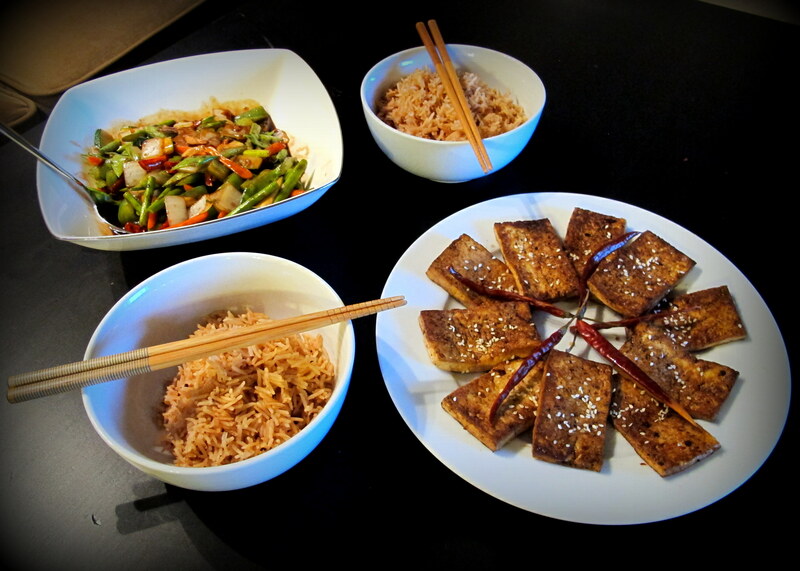 About a month ago we decided to replicate this meal at home, or at least try to. It worked out quite well, so we’ll definitely be making it again. 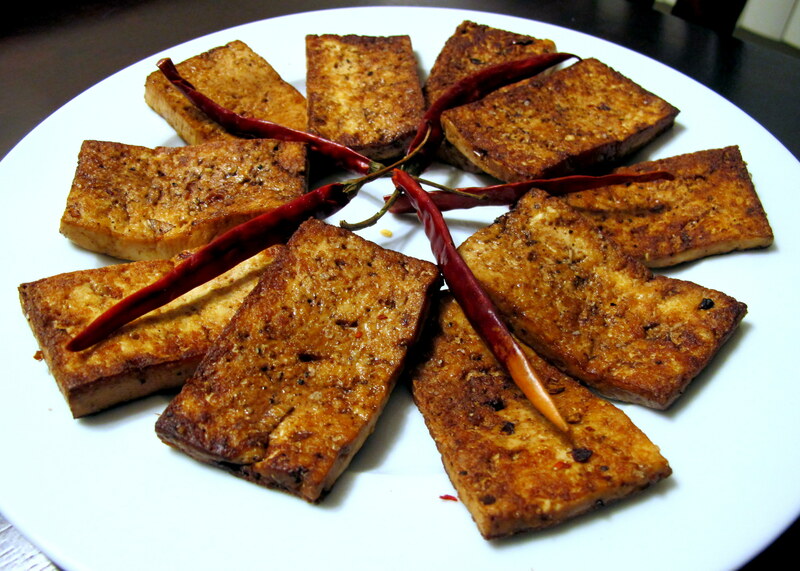 Tofu, while made from soy beans, mainly contains the proteins, so most fruct mals can tolerate a moderate serving of it. Make sure you only buy firm tofu, not silken tofu, which hasn’t been strained and is higher in the FODMAP galactans. Both chili paste and oil can sometimes contain garlic – make sure you read the labels and choose one without. The stir fry veggies that are shown below contain onion (Ev doesn’t have fruct mal); however it’s in such big chunks that it’s easy to pick out. This is fine for me, as I know my limits. If you are still on elimination, or are very sensitive to onion, do not cook with it in the pot to the end, as FODMAPs are water soluble and, if you do not stir fry properly (high heat, very fast) then water will leech out from the veggies, including fructans from the onion. Chinese five spice powder is low FODMAP in 1 tsp. serves, which is fine, because you normally don’t need more than that through an entire recipe. Garlic infused oil is FODMAP friendly. Sesame seeds are low FODMAP. About an hour and a half before you want to eat the tofu, slice them as shown and place them sandwiched between two chopping boards with paper towel in between, so that the layers go: chopping board, paper towel, tofu, paper towel, chopping board. Place a weight on top, it shouldn’t be more than a kilo. Leave the tofu like this for 20 minutes, so that as much of the liquid inside is squeezed out as possible. This allows it to soak up as much of the marinade as possible in the next step. While you’re waiting, mix the soy sauce, chili oil, 5 spice powder and garlic infused oil together in a tall/narrow container and set aside. When the 20 minutes is up, carefully place each of the tofu slices in the marinade container, ensuring that they are fully covered, and leave it to soak up all the flavours for another half an hour. While this is marinading, wash the rice and prepare the vegetables for the stir fry listed below. 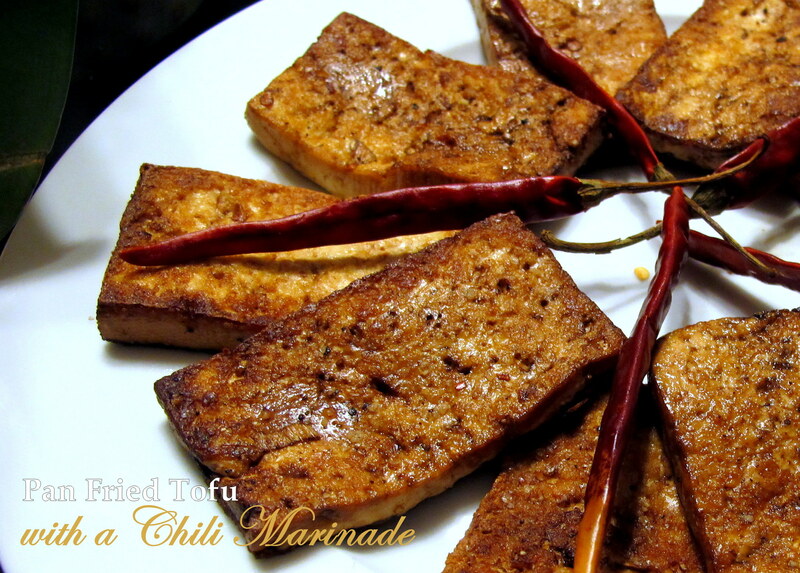 Once the marinading process is complete, remove the tofu and pat them down/wipe off as many seeds etc as you can. Seal a fry pan and pan fry the tofu over a medium-high heat for about 3-4 minutes a side, until they are slightly crispy. 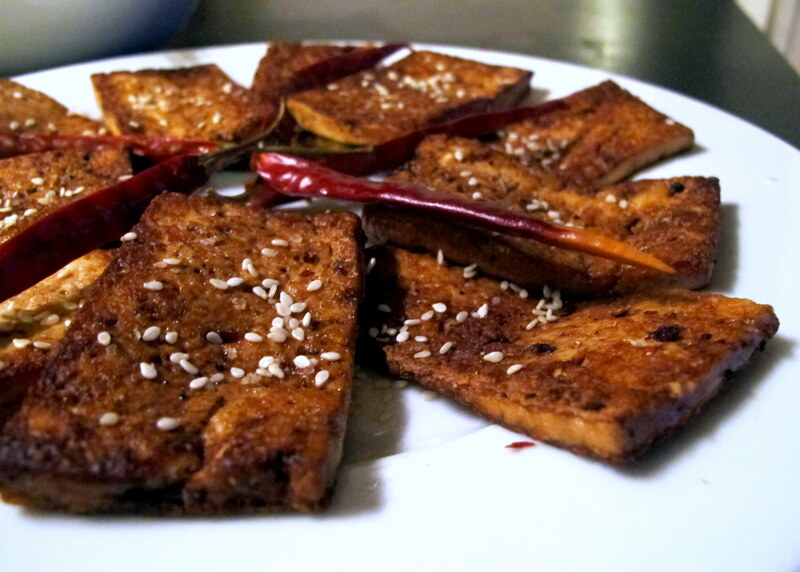 Serve with a garnish of the toasted sesame seeds and dried red chili peppers. Cook the rice according to these instructions, stirring in the 2 tsp. of 5 spice powder (bought or homemade with the recipe above in “notes”) before you bring it to the boil. This cooking process takes 30 minutes from the time you have finished washing the rice and it has come to the boil, so make sure you time it so that the individual dishes are done as close together as possible. Stir fry the vegetables over a high heat for a minute (you want them still slightly crunch) before adding in the leftover marinade from the tofu dish. Keep on the heat for another 30 seconds or so to heat the sauce through properly and then transfer to a serving dish. 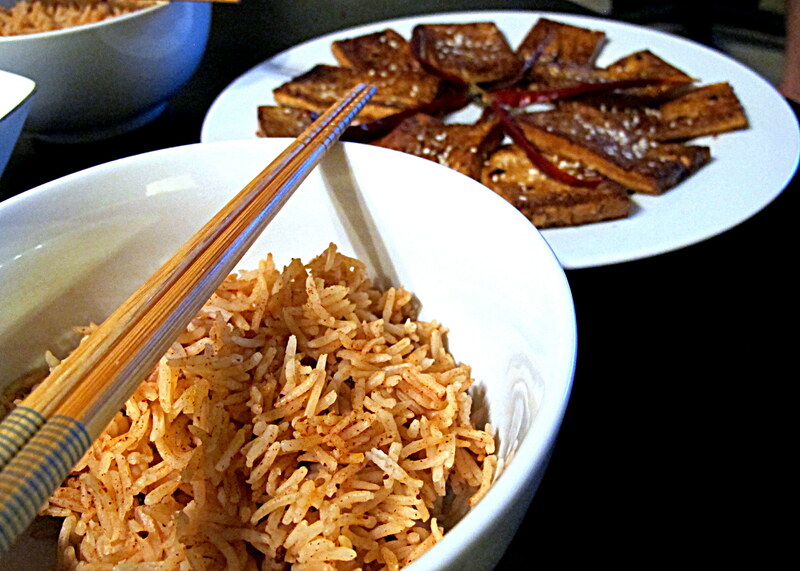 The best way to time this dish is to wash the rice and start its cooking process before you begin to pan fry the tofu, due to the time the rice requires to cook as well as the tofu requiring more attention. The stir fried veggies only take 5 minutes at the most to cook and plate, so they should be done last. If you need a more in-depth description of how to stir fry vegetables, then look at this recipe. If you like spiced and spicy foods, then this is the dish for you. I hope you enjoy it as much as we do!